On the eleventh day of gifting my true love gave to me…a student. Between classes, internships, and extracurriculars, they have a lot on their plate. These busy individuals are coming home for the holidays after exam season and these are the perfect gifts to give to help them unwind. We all know how stressed out students can be. This holiday season, give them the gift of self care with these mini face masks. Good for two uses and come in five different types to cater to all skin types from sensitive to blemish prone. Grab a couple and toss them into their stocking or grab them all and give them the whole collection. 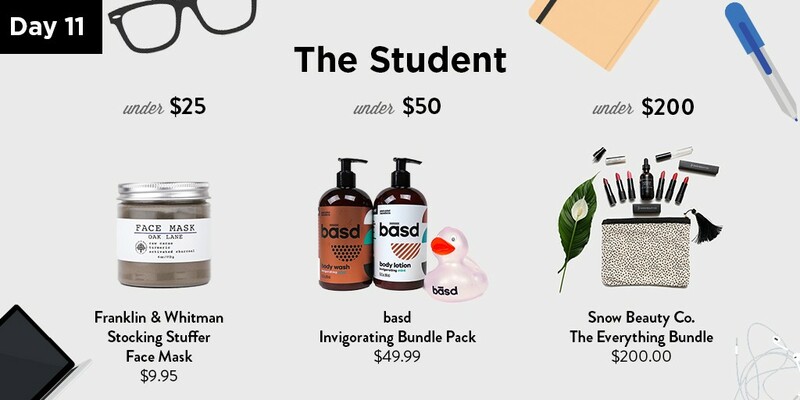 This bundle from basd Body Care is like giving three gifts in one! It comes with all three signature products including the basd body wash, a body lotion, and coffee body scrub that’ll help them relax and unwind. It even comes with a bonus lip balm all in the refreshing mint scent. It’s made with organic aloe vera juice and green tea. It comes in a perfectly packed box, so all you have to do is throw a bow on it. What to get a student for the holidays? How about everything! Give the gift of non toxic beauty with Snow Beauty Co! It makes the perfect gift for any student looking to build their makeup collection. It comes with their entire Austin Landmark’s Lipstick Collection of six beautiful shades for all occasions. It also includes a clear lip gloss to add some shine, a lip balm to protect lips against winter winds and multi-tasking argan oil that hydrates hair, skin, and nails. Think Dirty’s 12 Days of Gifting: Day 11 — The Student was originally published in Think Dirty on Medium, where people are continuing the conversation by highlighting and responding to this story.